At their dramatic Halloween-themed Anniversary Event, the Raid. kindly took the time to have an interview with us! Let’s see what their most memorable event was and get the details on their new release Merukari! Could you tell us how you joined the Raid.? Kazhi: I was probably the original member of the Raid.. I started to search for members on the internet, like on band recruitment forums, and found some other guys to do a band with. But everyone broke off, went different ways, new people joined and, before I knew it, we ended up with the members you see today. Bo_ya: At first it was Kazhi, Iori and I that decided to form the Raid… Then we found Sena. I’d been friends with Iori from a previous band, but I ended up taking a break from music for 2 years before the Raid. started. Iori: I knew Kazhi from when we were in different bands. Some things changed, other things happened, and we ended up with the 5 members you see today. Originally we had a different guitarist, and we continued playing as a 4 man band for a little after he left us. Then we finally found Yuuha. Yuuha was such an amazing guitarist that we wanted him to join us, so we decided to invite him into the Raid..
Yuuha: The Raid. is originally a Kansai band, and we met when I did a live with them with my previous band. We talked a little backstage and then, when my band split, I got a message from Sena inviting me to join the Raid..
Sena: We were all friends before the band, and wanted to try and make a go of music together. Originally I had an ordinary job as an ordinary member of society, but I made the difficult decision to quit and join a band full time. Could you tell us a little about the Raid.’s concept? Bo_ya: We don’t actually have a concept. We’re Kira-Kira, but even then not really Kira-Kira. As you can see by our new release Merukari, we have a different concept for each song, rather than as a band. We don’t stick to a specific genre, rather we jump around and do what we feel like at that time. This time we decided on a Japanese style song, and rolled with that theme. Sena decided on our costumes to match it, and I think he did a fantastic job. Iori: We don’t have one. If we don’t have one, we can do absolutely anything. Yuuha: We do anything we want to do. Actually, I really don’t like that word ‘concept’. Music is like food, right? You eat what you want when you feel like it. Oh, tonight I’ll have ramen. Maybe riceballs. In music I’ll do what I want when I like, that way there is absolutely no stress to it. It’s just plain, simple fun. Kazhi: We totally steered away from the idea of a band concept. The very fact that we don’t have an overall concept is our weapon in this scene. It keeps us strong, fresh. Sena: I think that we first started off as a digital, loud rock band and finally settled into what we are as the Raid. today. We don’t have one concept but many, and it’s always different so that the fans don’t get bored. Last time we had a Halloween concept. This time is a Japanese concept. You have a new release due out 3rd February 2016 called ‘Merukari’. From what I can see it’s a very different style from the Raid.’s usual music. What kind of themes often appear in the Raid.’s songs and where do you get your inspiration from? Bo_ya: Well Merukari is kind of sexual, with the old style of a Yoshiwara ballad. We have the same kind of theme running throughout the whole single, the old Edo, Japanese-style allure. When we first made this song, we started with a guitar melody that our amazing guitarists came up with for us and we built upon it. Usually songs are all the same in structure and style, so we wanted to change it up but having a very mature melody running all the way through and then switching abruptly to a brighter climax at the peak of the song. Ever since we first started the Raid., we’ve always wanted to make songs that are easy to listen to, and, since we don’t have a concept, it’s easy for us to change styles to do so. Merukari is a very modern concept of a Japanese style. However, today’s live has the concept of Halloween to go along with the theme of our previous release Yowamushi Monster. Tonight we’re going for the theme of ghosts and monsters, with a frightening atmosphere, like a haunted house. Iori: The two guitarists always make the greatest melodies and songs for us. Sena does the lyrics and some melodies. As a bassist, I don’t really have a hand in it. I would like to maybe give it a go one day, but, right now, they do such a good job of it, it doesn’t really matter if I don’t! –laughs- As for our new song Merukari, we’ve never done a Japanese style of song before, so I really think you’ll be seeing a different side to the Raid. with this song. Actually, I think the song where I’ve been hit with the most inspiration would be Yowamushi Monster. The famous notes ‘un papa un papa’ really inspired me to do something with them, and I wondered what it would sound like if it were a RAID song. Most of the time I’m inspired by colours or I see the songs I make as colours. I see myself as a brown colour, like autumn. And I often find inspiration in bright colours like blue, yellow, red and I want to express them as music. I also take a lot of my inspiration from Bo_ya, especially this time when we were making Merukari. Kazhi: We just go on our whims and don’t stick to themes. We haven’t done Japanese style yet, and thought it would be really good. You can see our ideas in our costumes this time around. Sena: Bo_ya guides most of our songs. He makes sure I deliver the sound he wants with the lyrics and guides them to create a specific image. When we make the songs, he makes sure that the instruments are not lost to the vocal’s voice since both lyrics and melody are very important to us. I usually write what I want, but it is Bo_ya that gives the songs form. As for my inspiration, lyrics usually just suddenly come to me in one instant. If I sit down and go ‘yeah! Today I’m going to write a song!’ I usually can’t do it. I write them down and then hand them to Bo_ya to see if they’ll fit any image he has. I really do like to include myself in the song though, my own thoughts and feelings. Saying that, though, in Merukari I thought a lot about the women in the song. Merukari is about the women in the old eras of Japan that used to sell their bodies for money on the street, prostitutes. It’s actually got a really black theme this time around. When I wrote the song I was thinking that people usually can’t understand why women would be driven to such measures, and I wanted to explore those reasons. Maybe the women are lonely, maybe they have no money, maybe they can’t feed themselves. That’s what I was considering when I wrote the lyrics for Merukari. What song would you like people to listen to in the Raid.’s repertoire? Bo_ya: Definitely Merukari. It’s our new release and the quality of songs are always improving as we grow as a band. We’re constantly honing our techniques, constantly getting better, so please listen to our new release! Iori: We have a lot of intense songs in the Raid., as well as a lot of more light-hearted songs that we always play during lives to bring about that live atmosphere. But on our releases you can see different sides to us, like melodic aspects, or ballads. We have a lot of good songs, so please try and listen to them all! Yuuha: Ah, this is probably a pretty average thing to say but I want people to listen to our previous release, Yowamushi Monster, and our current release, Merukari. If I were to choose a different song… I would go for Snow Pledge. It’s very like the imperial Tencho era that I really adore, so that’s why I like it. Kazhi: I would have to say that it would be Junketsu Piranha. When we had the chance to make that song, I thought that it would be really good for the Raid. to reflect the image that that song created. That’s how we want to be seen. It’s our title song as a band. Sena: Definitely Junketsu Piranha, our 10th single. I really want people to listen to the title song for me, because it is also the title song of the Raid.. It’s quite an intense, upbeat song, but easy to listen to. We have a lot of easy to listen to songs in the Raid., and because our theme changes every time, you can get quite addicted. I also think the coupling songs on the single are easy to listen to and that, even if you have never listened to the Raid. before, you would like them. The melody is really important to us and I think we convey that very well in Junketsu Piranha. Saying that, we also place emphasis on the lyrics. I guess what I’m trying to say that is, even though Junketsu Piranha is our title song as the Raid., I think that all of our songs are really good and I can’t choose just one…Please listen to it all for me, including our new release! Today is the Raid.’s 4th Year Anniversary Live at Akasaka BLITZ. How are you all feeling right now? Can you tell me what your most memorable live has been up until this point? Bo_ya: I’m looking forward to it. 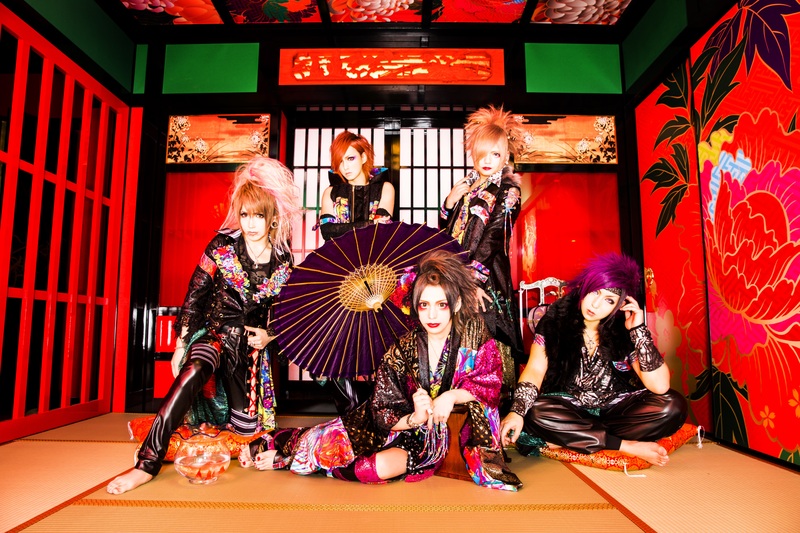 BLITZ is a big deal for Visual Kei bands. It’s where most bands record their live DVDs and the fact that we can play in such a big venue that means a lot to many bands carries a certain kind of weight and meaning for me. I think that the live I remember the most would have to be when Yuuha joined us as a guitarist. I also really remember our recent live at Osaka Big Cat. It was a large venue and a fantastic experience for both us and our fans. Iori: I’m not nervous at all even though this is our biggest venue so far. I just want to do a live like I would usually do and give everyone a great experience. Today’s live will probably the most memorable live ever. I think that my performance will be slightly different since it’s a big venue that we haven’t played, so I think I’ll be able to do things that I haven’t been able to do before. I want to surprise and amaze today. That’s the plan. Yuuha: We always play at different livehouses and the venues we are playing at just keep getting bigger and bigger. As the venues get bigger, I think it gets more fun as more people begin to join in. Saying that, I just want to carry on as I always do giving it my all. Just because this is a bigger venue, doesn’t mean that the live itself changes. I still want to enjoy it and be as energetic as possible because if I’m not, it’s not fair on those fans that can never make it to Tokyo, or to these large lives, is it? If I’m different just depending on the venue, I’m not being very fair to all the people that come and see us elsewhere. So I’m going to give it everything like I do every time, and I hope you enjoy it. Also, I know that sometimes in Visual Kei there can be a lot of discrimination against foreign fans because of the language barrier and so forth, so I really would like to apologise for that on the behalf of everyone. Kazhi: I’m truly grateful. Akasaka BLITZ will be our biggest live so far, with the greatest number of people in our 4 years as the Raid.. and I would just really like to thank everyone. It’s all thanks to the fans’ effort, and our staff, that we have got to this point. Thank-you. And the Raid. isn’t over yet! I want to show you more of the Raid. from here on out! If we’re talking about the most memorable live for me up until this point, though, it would have to be when we played our Tsutaya O-West Oneman 2 years ago. We used to be an Osaka band, and for an Osaka band to play such a large Tokyo venue that is coveted by a lot of Tokyo bands, was absolutely unbelievable. We never thought that we could do something like that. It’s a really important venue for a lot of bands, so to do a Oneman there was an amazing experience. Sena: I’ve played Akasaka BLITZ once before with an old band when we had a one-day revival. At that time, the vocal had unfortunately passed away, and I was support. There were so many emotions and so much turmoil on that day that I really couldn’t give it my all. It made me decide that I would play BLITZ again and I would give it everything I had. I wanted to return under my own power with my own band. Not only that, but BLITZ is a very important venue for all live bands. It’s a goal for everyone to play there at least once. The most memorable live for me was when we first played Tsutaya O-West in Tokyo as well. The only other Kansai band to have played such a large venue in Tokyo is Royz, I believe, so it’s a real source of pride for me. Now that we mainly play Tokyo, we’ve become a little distant from some of those fans in Kansai, but we won’t forget their support. I’ll never be able to forget our O-West live. What song or genre would you like to try in the future of the Raid.? Bo_ya: We’ve done kira-kira and kote-kote songs, and I think that we have a lot of unique music in the RAID. We like to make songs for entertainment, so I’d like to make a song with both a really good hook and a really good melody – a hybrid song. Yuuha: I love heavy metal and techno, so I really want to try a song like that for the fun of it. Kazhi: I’d like to do something like Junketsu Piranha again, and I also enjoyed our Halloween theme this time around. I’m excited for when we can do more, and make something new. Sena: Our songs are really different from when we first started the Raid., yet there are some people out there that have supported us from the very beginning. I’d like to produce a song in our old style for them, just to hear what they would think, and so they could see how much we have grown. NB: kote-kote is a style of VK that is very dark, often with a very hard rock beat or metal elements. Let’s talk a little about yourselves. What have you become interested in recently? Bo_ya: Skincare and body piercings. I like to keep my skin looking good and I’ve always had an obsession with piercings. My most recent piercing was one on my tongue. I have several there. Iori: Ah, it would have to be iPhone apps. I really love playing soccer games on my phone. I’ve played soccer since I was in school, so I really enjoy it. Yuuha: Ah… Bo_ya said what I was going to say… I took influence from him and started up a skin care regime. Other than that I’ve always been really into finding new music to listen to. There’s too many artists to list… let me have a look… I’m really into Periphery, Meshuggah, and Attack Attack! at the moment. Kazhi: I adore ramen, but recently the members have influenced me and I’ve fallen in love with Tsukemen. Right now I can’t get enough of Niigata’s Assari ramen. If you get the chance, I’d go and try it. But I wouldn’t exactly call it a recommendation, because I love too many types of ramen to choose. Sena: Recently I’ve become interested in suspense films. I love the reactions the build-up of suspense gives you. I search for good films on the internet and then go and watch them. Bo_ya: I’ve never done a proper job really. I’ve always just been in bands, so it’s my life even though I’m only 25. Being in a band is really important to me because it isn’t just about myself, it’s about giving to others and making them happier. I want to give them emotions and some sort of deep impression. I want to emotionally move people. Iori: I love it. I’m in a band because I love music. It’s only three words, but there is literally nothing more I can say. Only those words are necessary. Yuuha: If there is music, whether I am sad or happy or excited, I can control those emotions. If I’m having a bad day, I can release that tension or I can raise my spirits depending on the song. If it’s a sad song, and I want to play it, I can also make myself feel sad. I always want to have stable emotions. Kazhi: It’s my life. I’m the oldest in the Raid. and I’ve been in music for a long time. If I didn’t have music, I wouldn’t do anything. I don’t think I could. I have nothing else. Sena: Music comes from my heart. I would stake my entire life on music. What’s been your most important memory with the Raid.? Bo_ya: Everything just keeps getting more and more important to me. Everything from now and up to now has been super important. This interview itself is also precious to me. Iori: Our first oneman was very important to me. I had a band before the Raid., but we had never gotten big enough to do a oneman. For me, that was the start of my bandman life. To be able to do a oneman was the beginning for me. Yuuha: I struggle to remember people who come to our lives for the first time even though I try. But if that person comes time and time again I start to remember their faces. Then if they go and see other bands, or they stop coming to see us, I recall them, and I feel kind of lonely. But that’s humanity. We change what we like constantly throughout our lives and if those people happen to find something else that they like, as long as they’re having fun, I don’t mind. But if people come to like the Raid. enough to repeatedly come and see us… well that memory stays with me. Sena: Without a doubt it was when Yuuha joined the band. Kazhi: Today’s one-coin oneman live. I can’t believe that we’ve made it far enough to be able to hold a oneman at Akasaka BLITZ that only costs one coin per person. (NB: 500\). I am very, very thankful, and I can’t stress enough how important it is to me. I’ve always wanted to aim for producing 3 singles in one year as well, and it has been thanks to all our fans and the people that support us that we’ve been able to do things like that. Thank-you all so much. If you were to be part of a manga, anime or film, which would one you like to be part of? Bo_ya: I’d be Dragon Ball Z’s Majin Buu, because he’s fat, like me. His belly sticks out. I don’t really like Dragon Ball though. So I might also think about being part of Hokuto no Ken and be the character Heart, because I’ve been told I look like him. Iori: I really like Yankee manga, so I’d like to be part of CROWS. I really really enjoy those films. Kazhi: Dragon Ball. I love it. I love it so much, I can’t lose to anyone in how much I love it. I think that, although I’m the oldest, I’m the most childish in the Raid. Out of the members, I’m the one who likes anime the most, and I’ve always loved Dragon Ball. It’s always been there, and I’ve always loved it. I’ll never stop loving it. Sena: I have no idea. Probably a comical anime? Or some sort of parody. It would have to be cute though, and have loads of jokes in it. Iori: I’d go to Europe, specifically Italy. It’s really fashionable. I’ve never been abroad and only seen it on the TV and in photos, but the buildings and towns look beautiful. I really want to see it in person. Yuuha: I’d go back to America. I’ve been once and visited Beverly Hills and LA. I really enjoyed it. There were loads of instruments in America, it was amazing. Japan imports nearly everything so to go to the Guitar Centre in America and be able to see all the instruments in their original country was really amazing. I was very impressed. Kazhi: Italy. I want to try the pasta because it seems delicious. Or I’d go to Germany because I want to try proper German beer. Sena: If it was with the Raid., I’d like to go to Germany. We always have a lot of foreign fans at our lives, and most of them are German. We’ll probably see some of them today. I’d also want to go to Taiwan, because we see a lot of Taiwanese fans too! All the foreign fans are always here in Japan for us, and I want to be able to go and see them in their own countries! What message would you like to send to your foreign fans? Bo_ya: We’re active in Japan so you can probably only see us on social networking and on our homepage, but if you can come to Japan to meet us, we really, really want to meet you. We also really do want to go abroad and see our overseas fans because they’re waiting for us and we want them to enjoy our music live. Iori: Thank you for supporting us from such a faraway place. We want to be able to come and do a live for you, so we’re trying our hardest to get to that point. Yuuha: Music isn’t tangible so there are no boundaries to it. If it’s good music, it’s good music. You don’t have to speak the same language to love or understand it. I don’t understand Western films, but I love them anyway. It’s the same with music. So please try and listen to us. This time we’ve gone for a Japanese style nuance in our release, so it may be difficult to understand it at first, but if you like Japan and Visual Kei, I’m sure it’ll pique your interest. Please check out the promotion video for Merukari. Kazhi: The fact that we’re known abroad is absolutely amazing, and I’m really grateful for it. It’s unbelievable to me that our music affects people so far away. Please, keep supporting us! Thank you! Sena: Whether you are just across one ocean, or in a far country, I’m so happy that you know of us. In a not-so-distant future, we want to become a big band and come abroad to do a live for you, so please, continue to think well of us until we can come! Merukari is released on 3rd February 2016!